Tu Bishvat is not the holiday that commemorates the destruction of the temple; that’s Tisha B’Av, though I understand why it can be confusing. I had not even heard of Tu Bishvat until college when I attended a seder celebrating the holiday. And while it may sound a bit crunchy to celebrate a holiday for the trees, nuts and fruit, it comes at a time in our lives as modern Jews when appreciating our natural resources and the environment is more important than ever. You can host a full-on seder, or also just take a moment to appreciate and acknowledge our relationship to the land. 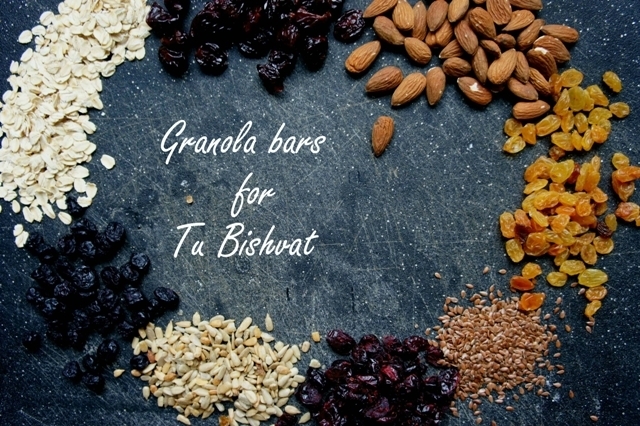 You can even make a batch of fruit-filled sangria, though my daughter and I decided to try our hand this year at chewy granola bars packed with dried fruit and almonds in honor of Tu Bishvat. We chose to use a combination of dried cherries, blueberries and raisins, though you could use any combo of dried fruit that you like. This recipe was inspired by this version from Alton Brown. Preheat the oven to 350 degrees. Grease an 8×8 square pan. 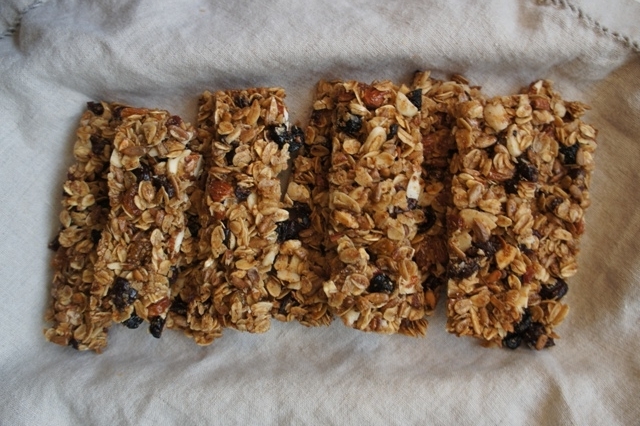 Spread the oats and sunflower seeds out on a baking sheet. Bake for 15 minutes, stirring 1-2 times. Meanwhile heat butter, brown sugar, honey and vanilla in a small saucepan over medium heat until brown sugar has completely melted. Once the oats and sunflower seeds are done toasting, remove from oven and reduce heat to 300 degrees. Place oats, sunflower seeds, flax seed, cinnamon, salt, almonds and dried fruit into a large bowl. Add melted butter-sugar mixture and combine until completely coated. Pour mixture into the prepared pan and spread out evenly using an offset spatula. 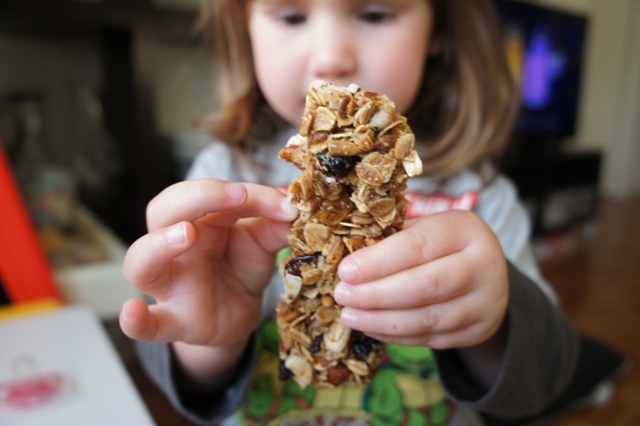 This step is important to ensuring even granola bars. Remove from oven and allow to cool completely. Cut into bars and store in an airtight container. Pomegranates, or rimonim in Hebrew, are one of the most recognizable and highly symbolic fruits in Jewish culture.